HALIFAX - Ottawa's plan to bolster the navy's fleet nudged toward the drawing board Thursday after it signed a contract to design the next generation of Arctic offshore patrol ships. The deal with Irving Shipbuilding of Halifax is worth an estimated $288 million and divides the design work into seven phases including engineering and project management before the vessels can be built. Public Works Minister Rona Ambrose said the work will assess capability, affordability and risk of constructing the ships, which is expected to begin in 2015. "The important part of this is to make sure we get the design right and at that time we will have substantive costs," Ambrose told a news conference in Halifax. Neither Ambrose nor Defence Minister Peter MacKay would specify how many Arctic offshore patrol ships would be built under the project. The federal government has promised to build between six and eight of the vessels. MacKay said the government's intention is to build "as many ships as possible" with the funding made available. "This is a new capability, so if we only had one more ship that would be one more than we have right now when it comes to our ability to provide this type of offshore capability and Arctic coverage," he said. Ross Langley, vice chairman of Irving Shipbuilding, said the design phase is expected to take 30 months and employ up to 200 workers at the company's Halifax shipyard. That would include a team of 90 engineers, technical specialists and program managers to be in place by the spring of 2014 and an estimated 110 additional workers who would build a vessel test module at the yard, Langley said. 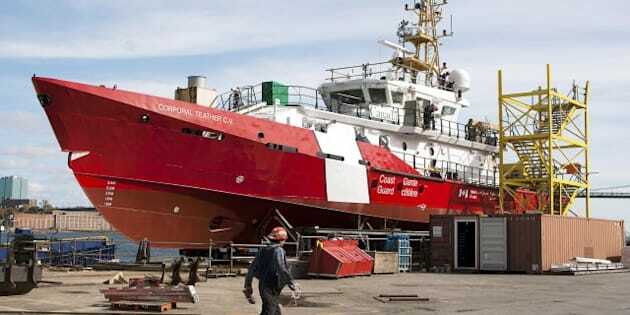 He said several subcontractors would also be involved and a Danish engineering and naval architectural firm, Odense Maritime Technology, has been contracted to do the design because the Halifax shipyard lacked the necessary expertise. "We had to seek experienced naval design expertise in Denmark to augment our own program here," he said. "But there are a number of other subcontractors and Irving that will participate in the evolution of the design." The ships were first announced by Ottawa in 2007 and were projected to cost $3.1 billion to build and $4.3 billion to maintain over their expected 25-year life cycle. They are the first vessels scheduled to be built under the $35-billion shipbuilding procurement project. In October 2011, the federal government awarded the Irving shipyard a $25-billion deal to build 21 combat vessels in all. Seaspan Marine Corp. of Vancouver is to build seven vessels under an $8-billion contract for non-combat ships. A contract for another $2 billion for smaller vessels is yet to be awarded. Irving Shipbuilding plans to spend $300 million to upgrade its shipyard including building a steel fabrication facility, an assembly hall, piers and a launch dock. The company secured a $260 million loan from the Nova Scotia government for the project. Note to readers: This is a corrected story. A previous version said the design contract was for eight ships.